If ever an organisation deserved to be put out of its misery, it is the National Federation of Subpostmasters. The NFSP has abused its position by consistently failing to support its members when they needed it most. Worse still, the NFSP has allowed its (now discredited) veneer of independence to be used by the Post Office as evidence that any Subpostmasters having problems with Horizon were either wrong, incompetent, or covering up some kind of criminal activity. The NFSP holds a uniquely responsible position. It presents itself as the independent voice of Subpostmasters and is the only representative body the Post Office will deal with. For journalists and politicians, membership bodies are one of the first ports of call when it comes to finding out more about a potential problem within an organisation. By failing to raise concerns about Horizon publicly, and by suggesting (through its silence) that the Horizon problem is a small matter of minor importance, the NFSP has done worse than nothing. It has caused irreparable damage. It has allowed the campaigning Subpostmasters to be presented as a tiny, disaffected minority, and it has hung its members out to dry. The reasons why are two-fold. "We have to be careful that we are not creating a cottage industry that damages the brand and makes clients like the DWP and the DVLA think twice. We do £350 million a week. We pay out £18 billion a year for the DWP in Government benefits. The DWP would not have re-awarded the Post Office card account contract, which pays out £18 billion a year, in the last month if they thought for a minute that this computer system was not reliable... If we are not careful, we damage the brand, we damage the franchise and we cost my members’ ability to sell the franchise." As a matter of policy the NFSP appears to think it is far better to throw the odd member under a bus than potentially devalue the product. The other reason is the total corporate capture of the NFSP by the Post Office. The NFSP was apparently once a respectable union, independently representing its sub-paying members. It is now effectively a department of the Post Office, funded by the Post Office and subject to an agreement which makes that funding contingent on a gagging clause. The clause requires the NFSP not to "take any action or engage in any commercial activities which brings, or is likely to bring, POL's [Post Office Limited's] name or reputation into disrepute." Furthermore, a High Court judge has found both the Post Office and NFSP intended that agreement be kept secret. "[Nick Beal from the Post Office] said that it was always the intention of the Post Office and the NFSP that the contents of the Grant Framework Agreement (“GFA”) made with the NFSP would be made public. I reject that evidence, which is contrary to the detailed confidentiality provisions within the GFA itself." "Mrs Van Den Bogerd [Post Office director] also gave evidence that the NFSP has publicly supported the Post Office’s view that Horizon is robust. The Post Office therefore relies upon this support by the NFSP to support its stance in this litigation." The judge decides this interesting dynamic needed to be properly investigated. First he dissects the NFSP's actions with regards to protecting its own position during negotiations over the implementation of the Network Transformation project. He quotes a 2013 email between the then General Secretary of the NFSP George Thomson and the Post Office in which Mr Thomson lists his demands for NFSP funding and compensation for members leaving the Post Office stating: "a signed agreement with the blood of both myself and Paula [Vennells] is necessary on the future of the NFSP before any agreement is granted on either NT and other points." "demonstrates that the NFSP was only prepared to agree what amounted to an increase in its members’ potential compensation, if its own future was assured by the payment of substantial sums to it. I find that this shows that the NFSP put its own members’ interests well below its own, and I also find that the NFSP is not fully independent." This email leads to the NFSP/Post Office "Grant Framework Agreement", which is bound by strict confidentiality stating: "neither party shall make public statements about this Agreement and/or the relationship established by this Agreement without the prior written agreement of the other party." The GFA is the same agreement which contains the gagging clause described earlier. This, remember, stops the NFSP from taking "any" action which could bring the Post Office's "name or reputation" into disrepute. The GFA only came to light after a protracted campaign by serving Postmaster and CWU rep Mark Baker, whose determined letter-writing and knowledge of the Freedom of Information Act eventually forced the Post Office to publish it. "I reject the evidence that both the Post Office and the NFSP always intended that the GFA would be made public... That assertion is verging on insulting the intelligence of anyone who has read the GFA itself. The drafting of the actual document itself – which has obviously been carefully done, by highly skilled legal advisers – is directly to the contrary. The assertion is also contrary to the Post Office’s own initial responses to the Freedom of Information requests, from the very team at the Post Office whose specific role in life is to deal with such requests." "There is also evidence before the court that the NFSP has, in the past, put its own interests and the funding of its future above the interests of its members,"
Let that soak in for a moment - a High Court judge has ruled the NFSP appears to be in league with the Post Office, has put its own interests above its members and is not remotely independent. Taking all this into account, it is perhaps not surprising that he notes, "the fact that the NFSP does not support the Claimants in this litigation is entirely to be expected." 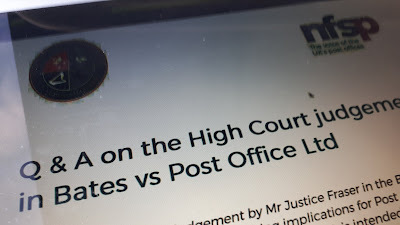 "We take this judgment and its criticisms of Post Office very seriously. While the culture and practices of the business have improved in many ways over the years, the Judge’s comments are a forceful reminder to us that we must always continue to do better. We have taken his criticisms on board and will take action throughout our organisation." This was the first time the Post Office had begun to recognise that the campaigning Subpostmasters and their MPs who have been jumping up and down for years might have a point. Admittedly a week later the Post Office was applying to have the judge recused on grounds of bias, but hey, a leopard doesn't change its spots overnight. The NFSP, however, doesn't even have the self-awareness to accept the judge's criticisms, describing them in a circular Q&A to members as "inaccurate" and "unfair". 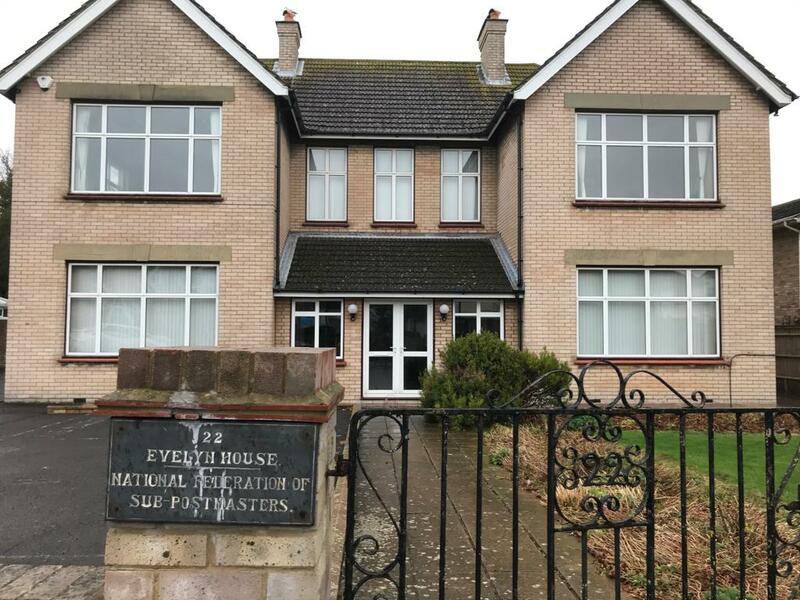 They contradict the judge's evidenced finding that their confidential agreement was designed to remain secret by asserting "The GFA was always intended to be a public document" without further explanation. 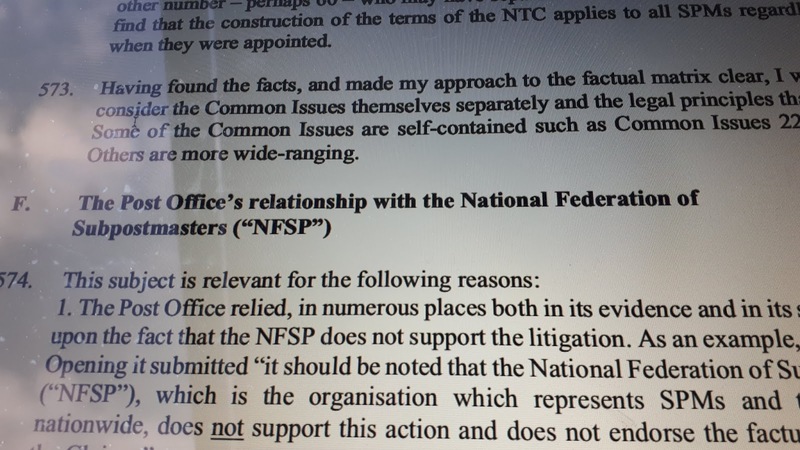 Its removal from the NFSP website in September 2018 is described as being part of a "refresh" and its sudden reinstatement during the common issues trial in November 2018 is framed as an act of public service, done "in the spirit of transparency" - something the judge found simply didn't stand up to scrutiny. 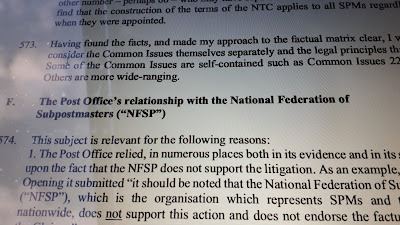 The circular went on to assert that the NFSP can and does challenge and criticise the Post Office, that the GFA (despite the evidence in black and white) isn't that restrictive really, and that it always puts its members first. Again no evidence for this was offered. 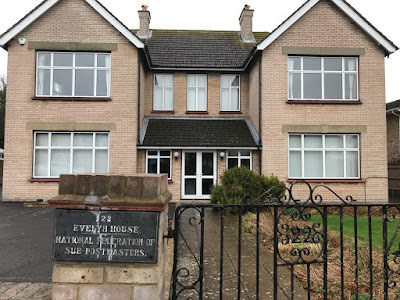 "Has the NFSP’s status as a trade association, funded by Post Office Ltd, prevented it from supporting the Justice For Subpostmasters Alliance? No. The claims being brought under the current litigation are historic cases and almost of all of them pre-date the Grant Framework Agreement; at the time, the NFSP was a trade union funded by member subscriptions." The apparent insinuation that the NFSP has ever supported the JFSA or that it might well be tacitly doing so now is a sly bit of wordplay. The NFSP has, to the best of my knowledge, never supported the JFSA, either when the NFSP was a membership organisation or union. Not just because nowadays it is contractually unable to do so, but because it never wanted to. "Why is the NFSP not supporting the claimants? Most of the cases date back to the early 2000s - before the N FSP became a trade association. Some of the claimants contacted the NFSP and we offered support and advice at that time. Many chose to take their own courses of action and act independently, including those who pursued a legal route. However, we have never tried to stop subpostmasters getting involved in the group litigation." It comes to something when a membership organisation is boasting that it has never actively tried to stop its members from seeking justice. That's a feather in the cap. I wonder why those members, after requesting support and advice (which turned out to be not to question the integrity of Horizon) decided to take their own courses of action. The circular goes on to list the work the NFSP has done and is doing for its members, and I don't doubt it does do some good, or there wouldn't be any reason for it to exist. Unfortunately it failed to help a relatively large number of members when they desperately needed it most. 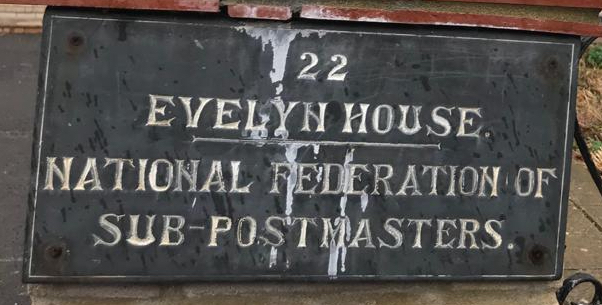 I have listened to the tales told by campaigning Subpostmasters about the first organisation they turned to when they realised the Post Office was going after them. In many cases it was the NFSP, and in almost every case (there are some honourable exceptions at local level), the NFSP completely failed, because it had decided, as a matter of policy, not to question the integrity of Horizon. This directly resulted in the NFSP's own members being suspended, sacked, prosecuted, criminalised, hounded for their life savings and ruined. These people depended on the NFSP for protection. They got eaten alive. The NFSP is a hopelessly compromised organisation. Its response to the High Court judgment suggests it doesn't even have the corporate self-awareness to realise it needs to go back and investigate what it has done in the past and start to make changes. I suspect it is not long for this world. Yet while it is still in existence, the NFSP remains capable of doing huge damage. It is powerful. It has a voice. It is still relied on by 8,000 Subpostmasters to protect their interests. Any of those Subpostmasters could have problems with Horizon at any time. The Post Office has the NFSP exactly where it wants it - in its back pocket. It can ignore it, collude with it, or use the NFSP's status and lack of involvement in this litigation as a fig leaf to protect its own interests. It does so, of course, safe in the knowledge that the NFSP won't get out of line. It has the contractual capacity to pull the NFSP's funding if it takes exception to any criticism the NFSP might dare make. I asked the NFSP for a statement or interview so it can state its case in the light of the judgment and my criticisms above. The response in full: "We won’t be responding to your questions or taking part in an interview." 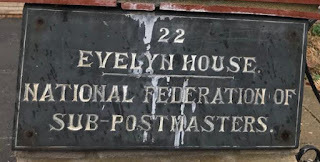 I realise this blog is read by serving and former Subpostmasters, many of whom were/are NFSP members. Most of the stories I've heard about the NFSP have been negative, but I doubt that's the whole picture. If there are examples of Postmasters who were helped out of a Horizon-shaped hole by the NFSP, and I'm sure there are, I'd be delighted to hear from you. Please use the contact form on this website. Likewise if you have an NFSP horror-story, please let's hear it. I am also more than happy to have a confidential conversation or correspond with any serving member of the NFSP at any level. Please do get in touch. Background information is very welcome.